Nordstrom paired with popular fashion influencer, @somethingnavy, to curate her exclusive fashion line. Using her stylistic knowledge and her captivated audience, Nordstrom hyped the upcoming collaboration with a series of previews, posts, and Promotions on her Instagram feed. 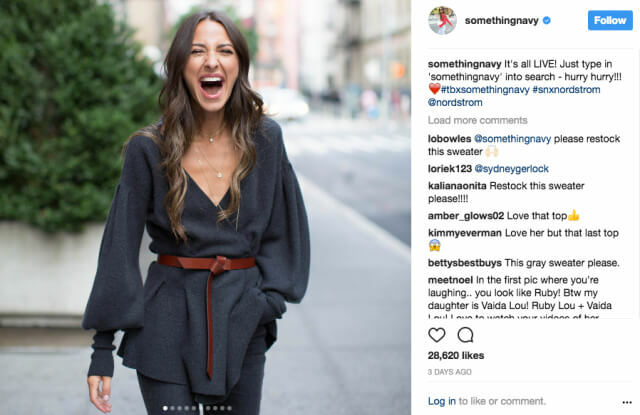 In just one day, Arielle Charnas reported that Nordstrom earned over $1 million in sales of her exclusive clothing line. Items were immediately resold on E-Bay, a reflection of the incredible popularity of the campaign. Looking to do influencer marketing in-house? Learn how Julius can help you identify, manage, and measure your influencer programs in-house.